Oliver won’t be the only one wearing something new when Arrow returns. After learning that John Diggle (David Ramsay) would finally be suiting up at Comic-Con, we now know what his costume will look like. [caption id="attachment_74302" align="aligncenter" width="613"] Diggle looking suspiciously like an X-Men villain...or Ty'Veculus. [/caption] ComicBook.com had the first look at Diggle’s new outfit, which isn’t too much of a departure from what he’d usually wear on missions with Team Arrow. Offering insight into the suit’s design process, Arrow EP Marc Guggenheim recently told EW that Diggle probably doesn’t think of it as a “costume.” “Oliver [Stephen Amell], in the last season, gave him advice in terms of concealing his identity, and so Diggle approaches it from a very practical standpoint. 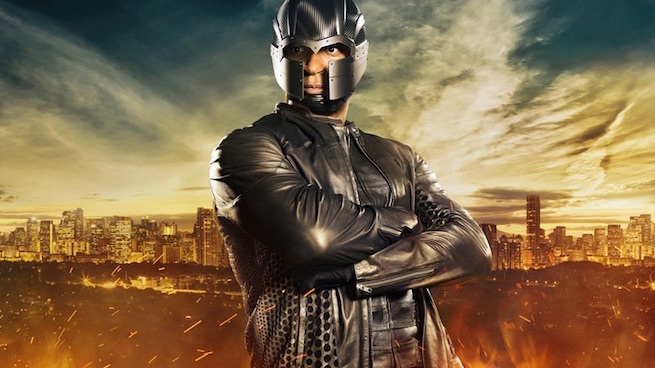 He followed Oliver’s advice and he’s got a means of concealing his identity, but I think Diggle would probably react to anyone calling it a costume.” Based on Guggenheim’s comments and the concept art shown at Comic-Con, it’s likely Diggle will have some sort of visor to keep his identity secret. At this point, it’s up in the air whether he’ll get a code name familiar to DC Comics fans, but given how Diggle (an original character created for the show) has been received by audience members, a superhero name made just for him certainly isn’t unlikely. Diggle's new look will be seen when Arrow returns on Wednesday, October 7 at 8 p.m. ET/PT on The CW.